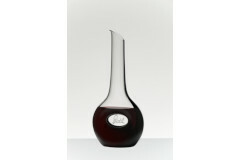 Riedel has created an innovative and impressive collection of decanters. From the serpentine inspired Boa, Eve and the most magnificent Mamba Double magnum to the Ayam inspired by a rare Indonesian bird, these hand-formed pieces are mouth-blown by glassblowers in Riedel's factory in Tyrol. These handmade decanters were designed by 11th generation Maximilian J. Riedel, the company's international award winning designer.